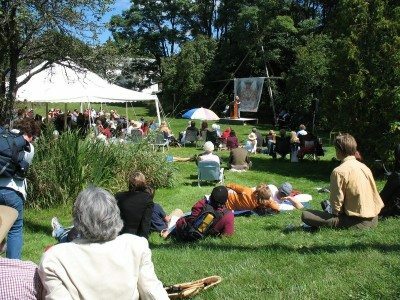 The Eden Mills Writers’ Festival has revealed its guest list for 2012. The 24th Eden Mills Writers’ Festival will take place on Sept. 16 and feature more than 50 Canadian authors. Among the writers who will speak at the outdoor literary festival are Michael Ondaatje, Michele Landsberg, Linden MacIntyre, Andrew Westoll, Kim ThÃºy, Carmen Aguirre, Richard Gwyn, Ami McKay, Eva Stachniak, Sheila Fischman, Alistair MacLeod, and Douglas Gibson. Allan Stratton, Mariko Tamaki, Teresa Toten, Helaine Becker, and Ted Staunton are some of the authors who will appear as part of the festival’s YA and children’s programming. Thousands of people flock to the small Southwestern Ontario town every year for the events’ open-air readings and author talks staged on the bank of the Eramosa River. The festival also includes an aboriginal writers’ stage, a children’s area, open mic readings, a book and magazine tent, live music, and a series of workshops and lectures held in the days leading up to the festival.